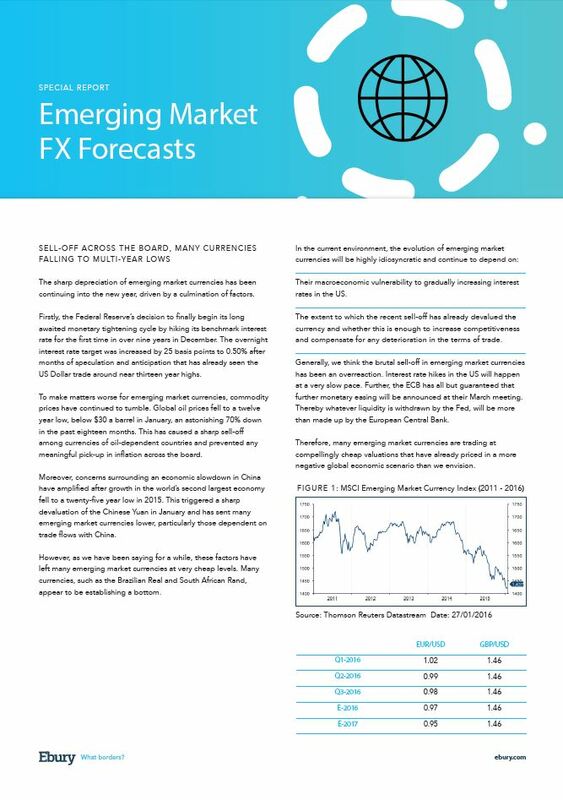 In our latest emerging market FX report (available for download below) we cover a range of currencies from the Brazilian Real (BRL) to the South African Rand (ZAR). One currency of particular interest is the Nigerian Naira (NGN), due to the country’s over-reliance on volatile oil prices and recent intervention by the Central Bank of Nigeria in the FX market. We’ve extracted the currency from the report to further explore the main drivers and potential direction of NGN over the course of 2016. The Central Bank of Nigeria’s efforts to stabilise the Naira at its de facto floor of 200 Naira’s to the US Dollar has been successful since policymakers moved the peg in February 2015 (Figure 1). In order to maintain the peg, the central bank has continued to intervene in the FX market and has implemented strong restrictions on imports and access to hard currency. As a result, foreign exchange reserves have fallen, although have stabilised of late and remain sufficient at around five to six months’ worth of imports. Recent commentary from the central bank has acknowledged the need to preserve FX reserves, with monetary policy ‘approaching the limits of tightening’. IMF calls in October for a devaluation of the Naira will no doubt increase pressure on policymakers in the coming months. Nigeria relies on oil for around 35% of GDP so the recent sharp decline in global oil prices, which fell a staggering 70% in the past eighteen months to around $30 a barrel, has had a significant impact on the Nigerian economy and its currency. However, depreciating pressure on the Naira from oil prices could begin to abate in the coming months. Oil prices have started to rally and tentatively appear to have established some kind of a short-term bottom around recent levels. The latest average forecasts from many of the world’s major banks suggest that oil prices could end the year around the $45 a barrel mark, a significant 40% higher than current levels. This projected increase in oil prices would no doubt alleviate pressure on the central bank’s FX reserves. Despite depreciating pressure on the currency, the central bank slashed its interest rate in November to 11% , from its record high 13%, in a bid to stimulate growth, which moderated to just 2.8% in the third quarter of the year. Growth forecasts for 2016 have been slashed, with severe strains from declining public and private expenditure meaning Nigeria could even fall into recession in 2016. We expect the Central Bank of Nigeria to be able to maintain the Naira peg against the US Dollar in the short-term. However, growing pressure from dwindling FX reserves means there will likely be a gradual devaluation of the Naira, roughly in line with the inflation differential with the US, of around 7% a year.